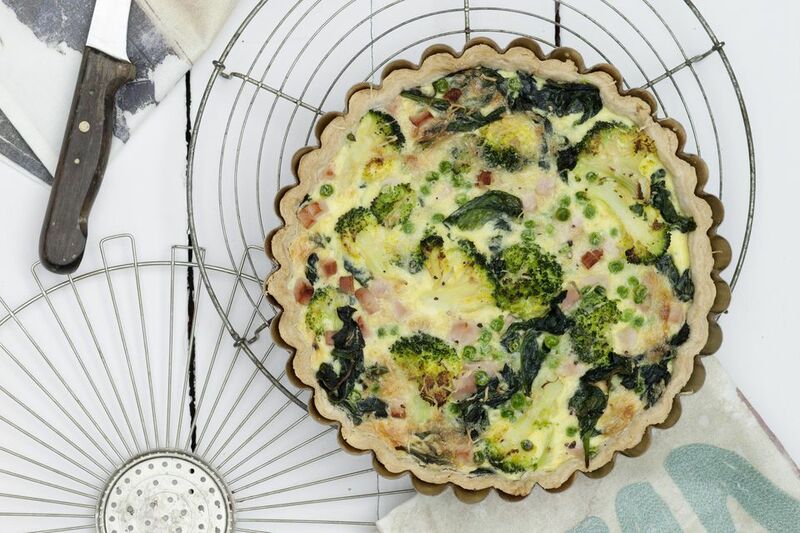 This turkey and broccoli quiche is flavored with curry powder and shredded cheese. The recipe calls for Gruyere or Swiss cheese, but cheddar, fontina, havarti, or another type of cheese would be good as well. Prepare this quiche for a brunch, or serve it for lunch with soup or salad. Line the unbaked crust with parchment paper or foil and fill it with dried beans or pie weights. Bake the lined crust for about 15 minutes, or until the edges are browned. Remove the crust to a cooling rack and carefully remove the pie weights and paper or foil. Reduce the oven temperature to 375 F.
Meanwhile, in a large skillet over medium-low heat, melt the butter. Add a few tablespoons of water along with the broccoli and onion and cook, stirring, until tender. Drain well. Sprinkle broccoli and onion, turkey, and cheese into the partially-baked pie shell. In a medium bowl, whisk the eggs until slightly beaten. Whisk in the half-and-half, curry powder, and salt. Pour the egg mixture over turkey and broccoli mixture. Place the quiche on a baking sheet and carefully move it to the oven. Bake the quiche at 375 F for about 35 minutes, or until a knife inserted in center comes out clean. To bake the pie in an unbaked crust, heat the oven to 425. Fill the unbaked pie crust with the broccoli, turkey, cheese, and egg filling. Place the pie on a baking sheet. Bake for 15 minutes and then reduce the heat to 325 F. Bake for 20 to 25 minutes longer, or until a knife inserted into the center comes out clean. For extra flavor, sprinkle the top of the quiche with a few tablespoons of diced cooked bacon. You may replace the turkey with diced ham, chicken, or browned bulk sausage.